PREMIUM: Hamalya Fresh Pack of 5 are made by most experienced chefs and of the highest quality. 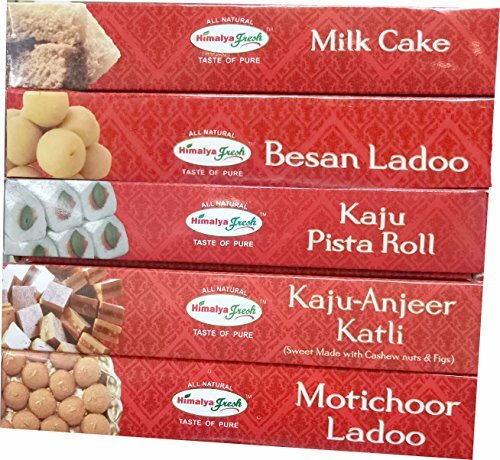 1 Box Kesar Peda, 12 oz - 1 Box Milk Cake, 14 oz - 1 Box Kaju Anjeer Katli, 12 oz - 1 Box Besan Ladoo, 12 oz - 1 Box Motichoor Ladoo, 12 oz. HIMALAYA: Packed in foothills of Himalayan mountains where water is pure and air is clean. BUY WITH CONFIDENCE: Buy Himalya Fresh Pack of 5 with confidence and worry free! If you have any questions about this product by Himalya Fresh, contact us by completing and submitting the form below. If you are looking for a specif part number, please include it with your message. Wundernuggets - Original Rosemary Chicken with Veggies and Whole Grains, All Natural - Pack of 6 Bags (14-16 wundernuggets in each bag) - Ready in Minutes!